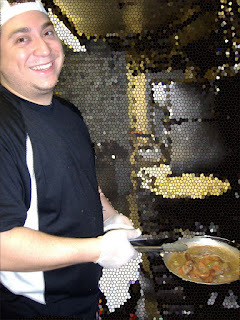 Guarino's Restaurant - 216-231-3100: Meet Carmen Puntel - 10 Year Veteran Cook! Meet Carmen Puntel - 10 Year Veteran Cook! If you've visited Guarino's Restaurant over the past decade, chances are you've heard of their fiery kitchen master, Carmen Puntel. Carmen, son of Guarino's waitress Marilou, has served Cleveland's Oldest Restaurant as a waiter, bus help, food expo, prep chef, and cook over the past ten years, and can operate in every aspect of the business. Carmen's favorite work in the kitchen is along the appetizer line, where he takes special pride in making "Gamberi alla Guarino," an appetizer made up of fresh shrimp wrapped in prosciutto and sauteed with garlic and olive oil. Carmen is an unlikely success story in the restaurant industry. Several years ago he was diagnosed with Leber's Disease, a unique illness effecting his vision. While many may pack up and retire when faced with this predicament, Carmen has risen above life's challenges and become a true asset to Little Italy and Guarino's Restaurant. Next time you visit Guarino's be sure to send your compliments to Carmen Puntel in the kitchen, who makes every entree with a smile.